Sunday June 12, Husband Walter and I traveled to Hattiesburg to celebrate birthday No. 92 with my mother. The past two years her children, grands, greatgrands and others gathered for the event. 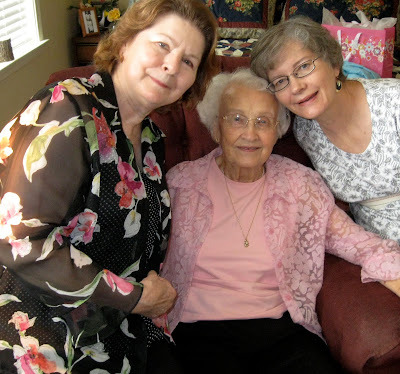 Early in 2011, Mother suggested that having one family at a time visit her during her birthday month and the months around June would give her a chance for more actual time with her individual loved ones. Simplicity worked for me, too, for this first visit since my stroke in April. Sunday we visited a little then lunched together in the dining room of Provisions Living where she has a studio apartment. After lunch family friends Elton and Joyce Raby visited. These special friends have maintained a tradition of breaking bread together once a week begun more than four decades ago when my father was alive and my younger brother and the Raby offspring were little. One of her nieces, my cousin Carolyn, also came by with birthday greetings. The visits in shifts were just right--birthday blessings that spilled over on me, too. Even so, Mother was feeling under the weather with symptoms of fluid building up again in her lungs. The next day, my morning call to her doctor’s nurse resulted in an appointment for that afternoon. Carolyn made yet another trip to the doctor with Mother. Carolyn has been wonderful. She brought Mother to the Coast to visit while I was in rehab and has been accompanying Mother to doctor’s visits in my absence. My mother is not the first individual, elder or otherwise, that Carolyn and her sisters Judy and Wanda have blessed with their love in action. They carry on the spirit of their late mother, my Aunt Evelyn, and they remind me of my own mother. They are from different generations, but all are women of unusual character and compassion. What a good looking group. That Caroyln certainly is a keeper. What a nice person. Your mom looks wonderful for 92. What a wonderful picture. Linda, you are so pretty! And I am so very glad that you continue to recover so much and were able to be with your mom on her birthday! you are so blessed to have your family there and able and willing to help. your mother looks wonderful. i like the birthday blessings spilling over onto you, just what you needed. i am with your mother. crowds make me tired. and it only takes about 4 plus to be a crowd now. Linda, you look wonderful. At first, I thought that had to be a pre-stroke picture. A handsome trio, particularly the old lady in the middle. Amazing lookers. I dare say that is not the most important bit for you, though; I am glad that you are able to write about having had a stroke, now that it's over. So many stroke victims suffer permanent or long term damage.